Thompson said the release of the RFP for the Launch Service Procurement will slip into April but will not be pushed out any further as some have recommended. WASHINGTON — A final solicitation for industry bids for the Launch Service Procurement competition will be released sometime in the next two weeks, said Lt. Gen. John F. Thompson, commander of the Air Force Space And Missile Systems Center. 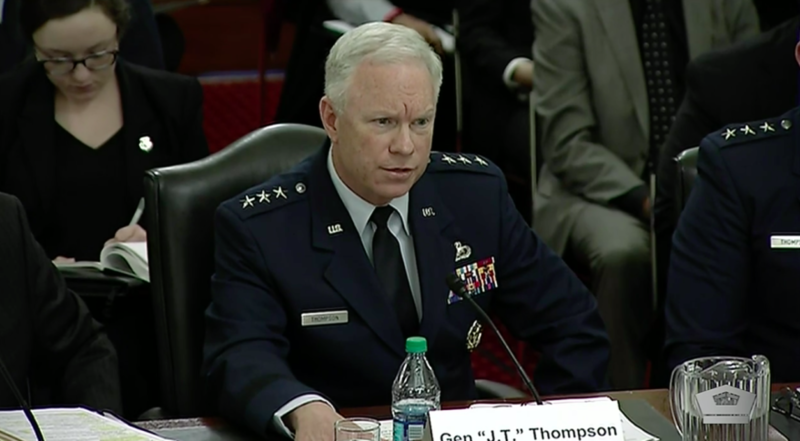 In testimony Wednesday to the Senate Armed Services strategic forces subcommittee, Thompson was insistent that the LSP competition must proceed as planned despite concerns voiced by launch providers that the schedule is too aggressive. Thompson also defended the decision to only select two companies to split as many as 25 launches 60/40 over a five-year period. Sen. Deb Fischer (R-Neb. ), the subcommittee’s chairwoman, and Sen. Martin Heinrich (D-N.M.), the ranking member, challenged Thompson to explain the Air Force’s rationale for narrowing the field of competitors — expected to be four companies — down to two by 2020. Likely competitors include national security launch incumbents United Launch Alliance and SpaceX, and new entrants Blue Origin and Northrop Grumman Innovation Systems. Blue Origin has argued that eliminating competitors in 2020 effectively ensures a launch duopoly for years to come and could push companies out of the national security market for good. The Launch Service Procurement, or LSP, is the first competitive procurement of launch services under the program that used to be called Evolved Expendable Launch Vehicle and was recently renamed National Security Space Launch. Air Force leaders had planned to issue the final LSP request for proposals (RFP) March 29. Thompson said the release will slip into April but will not be pushed out any further as some have recommended in order to give competitors more time to develop their vehicles. Of the four contenders, all but SpaceX are introducing new vehicles that won’t be ready for their first launch until 2021. Thompson said bidders will be able to update their proposals throughout the evaluation period — which would begin once proposals are received 60 days after the RFP is issued. Thompson gave another reason why the LSP can’t be delayed. ULA only has 12 RD-180 engines in inventory that can be used for national security launches awarded between now and 2022. Congress five years ago set the 2022 deadline for the Air Force to stop using the Russian-made RD-180 which is the main engine in ULA’s Atlas 5 rocket.